Member of Prussian National Assembly. German physician and statesman; born at Königsberg, Prussia, May 1, 1805; died there March 6, 1877. The son of a well-to-do merchant, after attending the Königsberg Collegium Fredericianum, in 1823 he entered the university in that city, devoting himself to philosophy and medicine. After completing his course (1827) he journeyed through Germany and Poland, and established himself in Königsberg as a physician in 1830, soon acquiring an extensive practise. 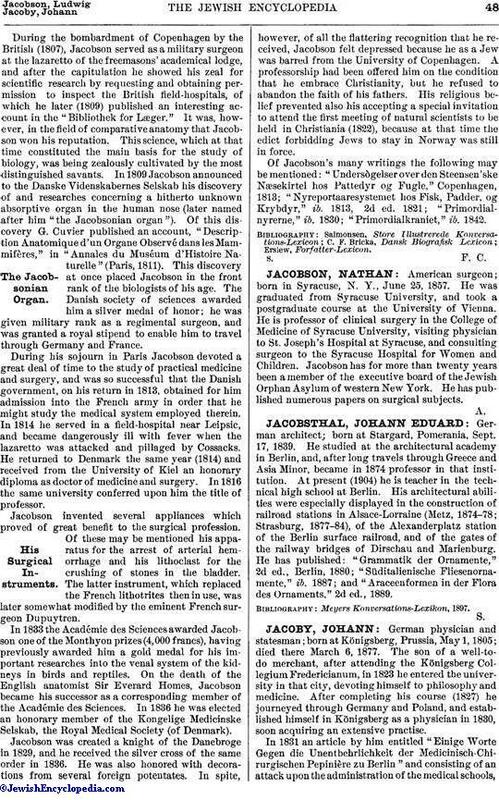 In 1831 an article by him entitled " Einige Worte Gegen die Unentbehrlichkeit der Medicinisch-Chirurgischen Pepinière zu Berlin" and consisting of an attack upon the administration of the medical schools,appeared in the "Zeitschrift für Staatsarzneikunde." The same year witnessed the great cholera epidemic. The disease was then almost unknown in Europe, and Jacoby hastened to the Warsaw cholera hospital, where he battled energetically to stem its progress. On his return he was invited to lay the results of his researches before the Königsberg Medical Society, the outcome being improved government regulations for the prevention and treatment of the disease. But Jacoby's principal field of activity was to be the political, which he entered with a pamphlet entitled "Ueber das Verhältniss des Königlich-Preussischen Oberregierungsraths Streckfuss zu der Emancipation der Juden" (Hamburg, 1833), being a reply to the pamphlet of Streckfuss, "Ueber das Verhältniss der Juden zum Christlichen Staate." 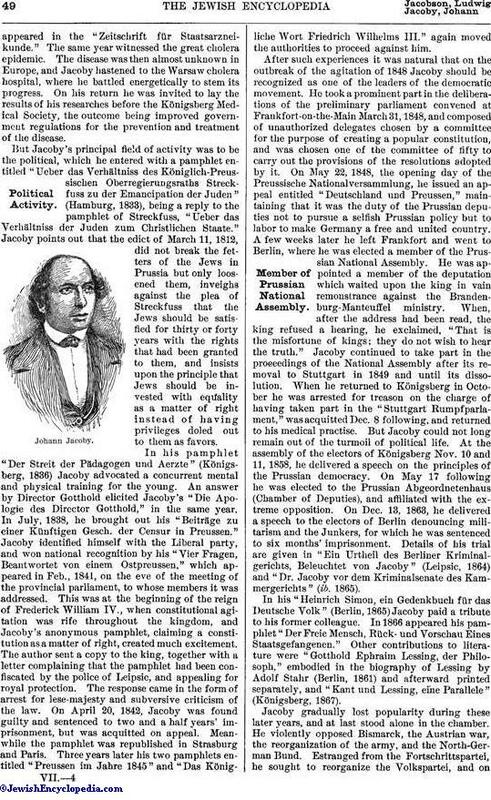 Jacoby points out that the edict of March 11, 1812, did not break the fetters of the Jews in Prussia but only loosened them, inveighs against the plea of Streckfuss that the Jews should be satisfied for thirty or forty years with the rights that had been granted to them, and insists upon the principle that Jews should be invested with equality as a matter of right instead of having privileges doled out to them as favors. In his pamphlet "Der Streit der Pädagogen und Aerzte" (Königsberg, 1836) Jacoby advocated a concurrent mental and physical training for the young. An answer by Director Gotthold elicited Jacoby's "Die Apologie des Director Gotthold," in the same year. In July, 1838, he brought out his "Beiträge zu einer Künftigen Gesch. der Censur in Preussen." Jacoby identified himself with the Liberal party, and won national recognition by his "Vier Fragen, Beantwortet von einem Ostpreussen," which appeared in Feb., 1841, on the eve of the meeting of the provincial parliament, to whose members it was addressed. This was at the beginning of the reign of Frederick William IV., when constitutional agitation was rife throughout the kingdom, and Jacoby's anonymous pamphlet, claiming a constitution as a matter of right, created much excitement. The author sent a copy to the king, together with a letter complaining that the pamphlet had been confiscated by the police of Leipsic, and appealing for royal protection. The response came in the form of arrest for lese-majesty and subversive criticism of the law. On April 20, 1842, Jacoby was found guilty and sentenced to two and a half years' imprisonment, but was acquitted on appeal. Meanwhile the pamphlet was republished in Strasburg and Paris. Three years later his two pamphlets entitled "Preussen im Jahre 1845" and "Das Königliche Wort Friedrich Wilhelms III." again moved the authorities to proceed against him. After such experiences it was natural that on the outbreak of the agitation of 1848 Jacoby should be recognized as one of the leaders of the democratic movement. He took a prominent part in the deliberations of the preliminary parliament convened at Frankfort-on-the-Main March 31, 1848, and composed of unauthorized delegates chosen by a committee for the purpose of creating a popular constitution, and was chosen one of the committee of fifty to carry out the provisions of the resolutions adopted by it. On May 22, 1848, the opening day of the Preussische Nationalversammlung, he issued an appeal entitled "Deutschland und Preussen," maintaining that it was the duty of the Prussian deputies not to pursue a selfish Prussian policy but to labor to make Germany a free and united country. A few weeks later he left Frankfort and went to Berlin, where he was elected a member of the Prussian National Assembly. He was appointed a member of the deputation which waited upon the king in vain remonstrance against the Brandenburg-Manteuffel ministry. When, after the address had been read, the king refused a hearing, he exclaimed, "That is the misfortune of kings; they do not wish to hear the truth." Jacoby continued to take part in the proceedings of the National Assembly after its removal to Stuttgart in 1849 and until its dissolution. When he returned to Königsberg in October he was arrested for treason on the charge of having taken part in the "Stuttgart Rumpfparlament," was acquitted Dec. 8 following, and returned to his medical practise. But Jacoby could not long remain out of the turmoil of political life. At the assembly of the electors of Königsberg Nov. 10 and 11, 1858, he delivered a speech on the principles of the Prussian democracy. On May 17 following he was elected to the Prussian Abgeordnetenhaus (Chamber of Deputies), and affiliated with the extreme opposition. On Dec. 13, 1863, he delivered a speech to the electors of Berlin denouncing militarism and the Junkers, for which he was sentenced to six months' imprisonment. 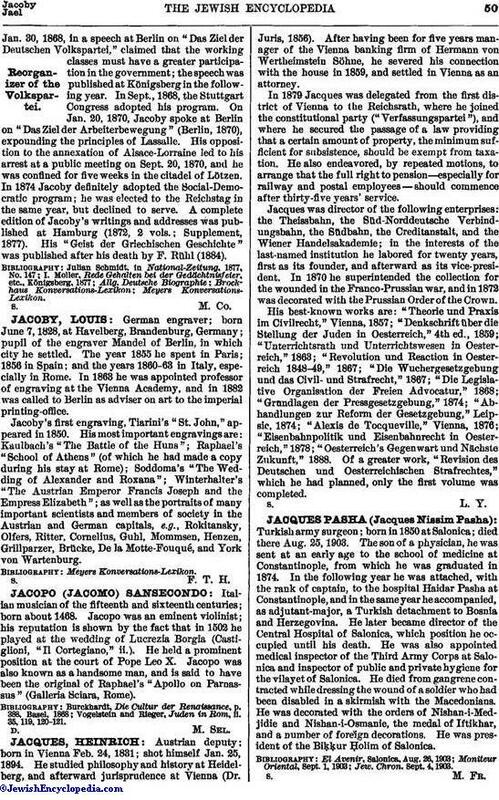 Details of his trial are given in "Ein Urtheil des Berliner Kriminalgerichts, Beleuchtet von Jacoby" (Leipsic, 1864) and "Dr. Jacoby vor dem Kriminalsenate des Kammergerichts" (ib. 1865). In his "Heinrich Simon, ein Gedenkbuch für das Deutsche Volk" (Berlin, 1865) Jacoby paid a tribute to his former colleague. In 1866 appeared his pamphlet "Der Freie Mensch, Rück-und Vorschau Eines Staatsgefangenen." Other contributions to literature were "Gotthold Ephraim Lessing, der Philosoph," embodied in the biography of Lessing by Adolf Stahr (Berlin, 1861) and afterward printed separately, and "Kant und Lessing, eine Parallele" (Königsberg, 1867). Jacoby gradually lost popularity during these later years, and at last stood alone in the chamber. He violently opposed Bismarck, the Austrian war, the reorganization of the army, and the North-German Bund. Estranged from the Fortschrittspartei, he sought to reorganize the Volkspartei, and onJan. 30, 1868, in a speech at Berlin on "Das Ziel der Deutschen Volkspartei," claimed that the working classes must have a greater participation in the government; the speech was published at Königsberg in the following year. In Sept., 1868, the Stuttgart Congress adopted his program. On Jan. 20, 1870, Jacoby spoke at Berlin on "Das Ziel der Arbeiterbewegung" (Berlin, 1870), expounding the principles of Lassalle. His opposition to the annexation of Alsace-Lorraine led to his arrest at a public meeting on Sept. 20, 1870, and he was confined for five weeks in the citadel of Lötzen. In 1874 Jacoby definitely adopted the Social-Democratic program; he was elected to the Reichstag in the same year, but declined to serve. A complete edition of Jacoby's writings and addresses was published at Hamburg (1872, 2 vols. ; Supplement, 1877). His "Geist der Griechischen Geschichte" was published after his death by F. Rühl (1884). Allg. Deutsche Biographie; Brockhaus Konversations-Lexikon; Meyers Konversations-Lexikon.